How do you handle a dog not eating regular dog food? My two rescued pitbulls are the most picky eaters in the universe. I'm currently trying to get them to eat Iams healthy naturals-weight control. This due to my 7 year old female, being a bit overweight. They only eat once in the morning and once in the evening. They will not eat this or any dry food plain. I must add people food or canned food with it. I know this may not be the best thing to do. When I resort to ppl food it is boiled chicken and vegtables. The only canned food they seem to like is Alpo and I don't feel that is very healthy. How can I get them to eat just the dry food? Most ppl I ask just say only give them the dry food no matter what and eventually they eat it. Sounds good in theory until my babies sit and stare at me with the "I'm starving and your mean" look. Of course I eventually give in and all is right with the world. What to do, please help! I have tried many different types of dry food expensive and inexpensive, they will have none of it alone. Should I be worried? At this point I just want to make sure everybody is happy and healthy and do the best by my angels! First of all, thank you for choosing rescued pit bulls! From a nutritional standpoint, I don't think there's anything wrong with adding a bit of meat and vegetables if it makes the kibble more palatable to your dogs. 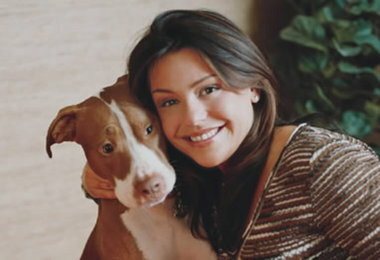 Lots of people cook for their dogs on a regular basis including Rachel Ray (who happens to have a beautiful pit bull named Isaboo). In my own experience, I've never had a dog that wasn't passionate about their food unless they were sick. So, my first inclination would be to have them both checked out by your vet. Just to be sure it really is pickiness and that there's not some type of infection or condition that has spread between the two of them. As far as kibble goes, I've noticed that some brands have a stronger aroma than others. My Merlin LOVES Blue Buffalo Wilderness Salmon. It has a strong aroma that is not unpleasant, but quite noticeable. A serving suggestion found on the package is to add warm water to the kibble "to make it more savory". So, maybe smell, at least for some dogs plays a role. Hopefully others who have actually dealt picky eaters will add to this article and offer their suggestions. Comments for Dog Not Eating. My pibbles do this to me sometimes too (not just when they're sick - I think they get bored with dog food). I used to add warm broth to their food, but found that just adding warm water does the trick. They scarf it up whenever I do this! I used to think my rescue pit mix was a picky eater then I discovered I was just feeding her too much. I was trying to feed her breakfast & dinner, now it is just dinner & she eats all of it every night. I know it is very difficult to ignore their I'm hungry stares but they probably really aren't that hungry,especially since 1 has a weight issue & they know they have you trained to give them what they want. My Chloe will always eat treats & anything that isn't dog food at any time of day even if she has just finished her dinner. Know that you are doing the right thing for their health & don't give in or decide that you will always add a little bit of human food & just make sure it is healthy for them human food. The choice is yours. I have used garlic powder in dry food before when I had a dog with a cold that was not eating, the smell of the garlic was strong enough to entice her. I also right now am using Wild Salmon Oil in the dry food, a couple of squirts, for health purposes but it has a bit of fishy odor they seem to like and eat it up right away. Thanks Gale, I sincerely appreciate your input. Both of my dogs have been to the vet, only problem seems to be that my female is obese! Not sure how when she eats the same as the other one. I think it is because she would rather be a couch potatoe and he likes to run around like a freight train. I am going to try to stick with the Iams and keep boiling chickens for them (deboned of course). I just don't like the canned food. Not quite sure whats in it but it can't be all that good for $1 a can. I think your dogs might be outsmarting you! If they wait it out long enough you'll give them people food - and don't think that they don't know it! Haha. I think the wild Salmon oil is an excellent idea, if it works for your dogs, but you might just have to try slowing reducing the amount of human food you mix in to wean them off of it over time. You might have to separate them to feed them as well so you can feed your boy more goodies, and help your girl lose weight. Good luck - and well done for rescuing pits! My boy friends dog was such a picky eater so we tried a lot of different foods. We finally found that he loved "Purina one" smart blend small bites beef and rice. we tired lots of the expensive foods out there and he has been eating this for about 10 months now. sometimes i add warm water to make him think he's getting a special treat in his food. it also helps with his skin allergies too. I had always given just dry food to my pits until my newly adopted female kept vomiting it back up. My vet told me that dry food is harder for some dogs to digest, so wetting it not only makes it more palatable (so they'll eat it all at one time), but easier to digest. He suggested adding low sodium chicken broth or a spoonful of canned food to their food. I have to add some powder supplements to my dog's food which she can taste so the broth alone didn't work for me. I was never a fan of canned food either, but I found one called Evanger's. It's hand packed and very high quality, it has actual meat and veggies in it. I use the chicken stew because it's an actual stew so I can put a spoonful on the dry food and it mixes really easily. It can be hard to find and it's expensive, usually around $3 a can, but it works great for me. I have a rescue pittie also and we went through 6 different foogds before we found one she would actually eat. We ended up with the regular Blue Buffalo adult formula, but I still have to use a gravy mix to get her to eat it. I use this stuff called Vita Gravy to make it more appealing to her. Still sometimes she only eats once a day or half at a time, especially when it's too hot out to do much walking. Our vet said said as long as she doesn't lose weight not to worry about it. She just doesn't have a huge appetite As long as you've had them checked out and they are otherwise healthy, just watch that they don't start losing too much weight. Good Luck! Your dogs will eat when they get hungry. If they are waiting, staring at you... and you have trained them that staring at you gets them special kibble, then you've been duped! Untrain that one!! LOL! Get them the healthiest food you can afford without skipping things like electricity or your own food, and stick to your guns. Unless someone has a NEED for something special, you can trust the name brands to keep them fed and healthy. And if the princess is slightly tubby, make sure to take her for a walk a few times a week to help her feel better and to slim her down some. If you don't like "walks," then perhaps a game of Fetch would suffice. When she gets hungry, she will eat pretty much anything you put in her bowl. Rest assured, if you are offering them good food -- they won't starve. They'll un-learn that trick/habit of staring at you. I can really identify with this issue--My dogs have always been picky eaters, and I blame me. And they have not all been Pits. My present dog, a lovely Pit Bull, however, is no different. I guess I am just TOO nice to them. :) They must know how to "play" me. I finally caught on just recently, although I suspected it for some time. This dog, Maggie, gets a small helping of dry kibble in the morning, which she never eats. I give her a couple special chicken rawhide treats after her walk in the afternoon. Lots of cheese at lunchtime, though. Dinner is 1/3 can Alpo, and 2/3 dry food. If she doesn't eat her dinner by next morning, then i cut back for the next day on dinner. Bottom line: Sometimes she is ravishingly hungry, and other days not so much. I walk her every day. She has maintained her weight consistently at about 55 pounds. (Wish I had her figure!) So...I guess she knows what she needs. For now. She is only 4-1/2. I have 3 dogs, 2 pits & a mutt..the mutt ALWAYS eats whatever & the pits are more picky. Some times they do the same with the what is this stare. My female is more picky & i have found HOT water actually gets her to eat 90% of the time. It makes the food (Iams also) smell more & I think they like it with the GRAVY at least that is what I say...OHHH U want some gravy in it & I get the hot water & stir it around so it cools off a bit & the smell comes out. Sometimes I just sit with her giving her one piece at a time & after a few pieces she'll eat the rest. If they don't eat I just pick it up (as the others will eat it if I leave it) & offer it later cuz I think sometimes they do have a gut ache or just don't want to eat. They have never gone for days without eating but they do skip a meal or 2.
its a dogs life eh! hi, i find that a beefy smell tends to get a fussy dogs attention, you can put a beef gravy over your dogs dry food or mix the when i rescued mt pit i was doing what i usually do & feed them the best branded foods, but my dog was having runny poo's i took him to the vet & my dog had a sensitive stomache, he then told me to feed my dog 1 of the "cheap" foods i hated buying it as i was thinking people were judging me haha but the food isnt bad because it isnt a big brand with a big price tag if your pets like & eat it then i would mix it half & half with dry food & why not take this "cheap" dog food to the vet with you & ask them if its okay the less gravy in a tin of dog meat the better not the price, but give them their chicken in pices as a treat through the day some days you dont want to waste money either all the best. I have a 9 month year old pit ... I had him since he was 6 weeks he use to eat without a problem he was a cute fit puppy once he grew he started being picky about his food I bought him blue buffalo and he would just nibble at it and he started loosing ALOT of weight so I switched to pedigree (which I prefer not give) and the same thing happened so the only way he would eat it if I mixed wet food with it but he"ll sort of pick it out (very smart) the only thing I got him to like was kibble and bits (steak) but I feel that's not enough ... What should I do ? us when we adopted her that she has a lot of allergies skin, food and airborne oh yes she gets horriblely car sick as well.